Wednesday is the best day of the week because that’s when the new books arrive in stores. Here are some of the comics scheduled to hit the shelves on November 2, 2011. Your local retailer will probably have these and others, so make sure to check with them for more details. 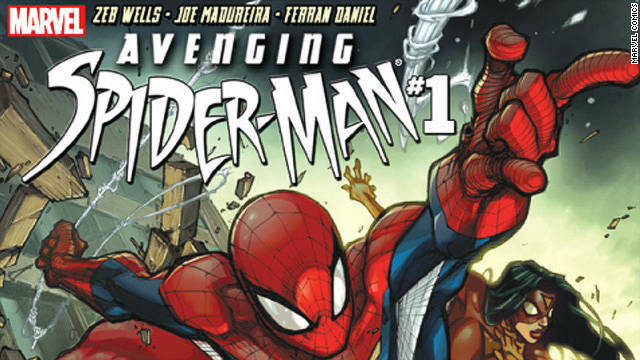 This week I am excited to read Marvel Comics Avenging Spider-Man #1. Marvel was nice enough to give me sneak peek at this book. The art is well done and the writing is funny and exciting all at the same time. I also got a chance to talk to series editor Steve Wacker. CNN: What can the readers look forward to as this series progresses? Wacker: The best of everything Marvel every month. We’ll have our top talent matched with our top super hero Spider-Man as he meets the denizens of the Marvel Universe … such as Hulk, Iron Man, Thor, Captain America and Wolverine. CNN: What separates this Spider-Man book from the web-slinger's many other titles available these days? Wacker: Our flagship title "Amazing Spider-Man" is published twice a month and in that title we really get into the life of Peter Parker and how he struggles to maintain his identity as Spider-Man. This new sister title "Avenging Spider-Man" focuses almost solely on Spider-Man, so really it’s just the battles, the exciting, death-defying visuals fans are dying to see. Also, "Avenging Spider-Man" #1 is the first issue that Marvel will offer a digital combo pack and kicks off their day and date release of the digital products. So there you have it, Spider-Man titles categorized by a man who knows what he's talking about. Is there a comic out there besides Spider-Man that you are really loving? If so let us know in the comments. We are always looking for tips on good comics! Uncanny X-Force is probably the best book at Marvel right now. I'm looking forward to the new issue.